One of my greatest joys in this position as the Dominican NGO representative at the United Nations is the opportunity to mentor some wonderful young people. Over the past several years, these have included Alex Sajben, Kati Garrison and Abby McCrary—our Dominican Volunteers—and all Notre Dame graduates; Justin Goldberg from the University of Massachusetts, Amherst; Mackenzie Riley, from Dominican College, Blauvelt; and most recently, Fungai Mboko, a student at Aquinas College in Grand Rapids, Michigan. Fungai arrived amidst the cold and snow of January, and participated in the Commission for Social Development as well as the Commission on the Status of Women. A native of Zimbabwe, he brought a wonderful mix of high energy, warmth, critical thinking, and great humor to the office, as well as a great appreciation for the development dilemma which many countries must contend with—most especially countries in Africa. Both Abby and I loved working with him! 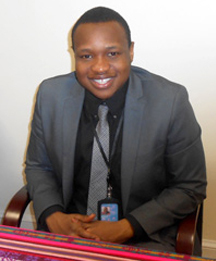 What follows are Fungai’s reflections on his experience at the UN. Fungai and the other young people who have graced this office have been a source of great inspiration and hope for me. I have no doubt that their passion for justice and their desire to help make our world a better place will have far-reaching effects as we move into the future. As I write this, however, I can’t help but reflect on what a stark contrast it presents to the situation in Nigeria—where 276 girls have been kidnapped by the terrorist group Boko Haram, whose name means “Western education is sin.” These girls will ultimately be sold into slavery, and/or forced into early marriages, never knowing the opportunities that my young visitors have experienced. While we may feel quite powerless to change this tragic situation in Nigeria, perhaps we can recommit ourselves to supporting young people wherever we are, in their efforts to bring about the transformative change that the world so desperately needs. When I first arrived at the United Nations I was unsure of what to expect. I knew about the Millennium Development Goals (MDGs) and how they were supposed to be the roadmap for implementing the Millennium Declaration commitments. These commitments were intended to drive the world into a new era of prosperity by focusing on structural poverty and inequalities, sustainability, and principles such as freedom, equality, tolerance, solidarity and respect for nature. I understood that the MDGs fell short of the ideals set by the Millennium Declaration for many unforeseen reasons such as natural disasters and the crippling global financial crisis of 2008.The list of unforeseen difficulties goes on, and is different in every country. I believed that the problem of political integrity, coupled with the lack of an accountability and data-sharing mechanism, was the biggest hindrance to the success of the MDGs. I came to the United Nations to see how the proposed Sustainable Development Agenda would be framed in a way that would safeguard the process from these issues, and indeed take the world on the path to the future ambitiously dreamt of in the millennium declaration. What I found after reading UN reports and discussions with Sister Margaret is that the MDGs have a fundamental flaw. Development outcomes are treated in isolation, undermining the interconnection between human rights standards and development. This compartmentalization was created in an attempt to be measurable and would ultimately be the undoing of achieving the ideals outlined in the Millennium Declaration by the target year of 2015. I sat in on every single meeting I could attend during the various commissions, working groups, thematic debates, side events and parallel events on the formulation of the Post-2015 sustainable development agenda. What I learned is that the proposed SDGs are being framed with such care and special attention is being brought to every possible shortcoming in the process. The Sustainable Development Goals are rooted in a human rights framework, rather than an economic development framework. This shift to a human rights based approach to development is very exciting, but in no way is it a new idea. Whenever I talk with people about my experience at the UN, I find one question is asked the most “What did you not expect?” The answer is simply that there are people who have already figured out how to reach the world dreamt of in the Millennium Declaration. In fact, they’ve known how to reach it since before the inception of the United Nations itself. I don’t mean to say that there is a secret “skull-and-bones society” that has vaults full of complicated trade deficit stabilization formulas or templates for peace treaties that would calm decades of conflict and reunite countries. I mean there are people who have dedicated their lives to the very values that need to underpin the practices of leadership, development programs, NGOs, government or individual. Someone once told me that the United Nations may just be the last great hope for humanity. I disagree. I believe that people like the Dominican Sisters, all NGOs, community organizations, grass roots movements, and the wonderful individuals I came across within the UN system represent the last great hope for humanity. The spirit of loving fellow man, respecting nature and caring for each other in times of need that the UN captured in its inception is our last great hope. This spirit is the same spirit that civil society has been steadfast in operating with and advocating for in times when it seems it has been forgotten. The organization itself will have its flaws; the SDGs will not be perfect. Nothing can be all things to all people. This was an exciting revelation, because this means I don’t need to have various degrees from a prestigious school and years of research on a six-figure grant to participate in steering our world in the right direction. Simply living with those values at heart will lead to a call to action in addressing global problems at the community level. With that in mind, I’d like to end by thanking all the Dominican Sisters for their hard work, and ultimately the great example, hope and motivation they provide to me and all other young people that are lucky enough to be around them.